Are you thinking about parking all wrong? I made the mistake of looking at the comments below this news item from Melbourne in Australia. It discusses a proposal to make zero-parking residential developments easier for local governments to allow (in certain circumstances). It is a modest proposal. But many of those commenting on the article are utterly outraged, asking how anyone could be so extreme or so crazy to want to allow buildings with no on-site parking. Why are they so shocked and angry? I think these reactions are based in a particular mindset on parking. This mindset has been fostered for decades by mainstream planning for parking and is still being reinforced in most cities. Most people never question it. Proposals that are not consistent with this mindset will seem shocking to such people. 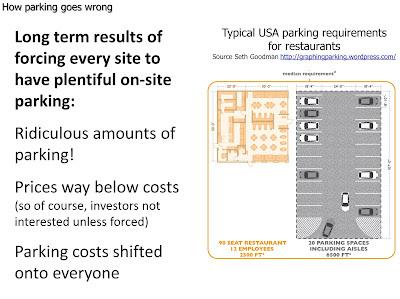 The parking revolution we talk about at Reinventing Parking depends on very different mindsets on parking supply. 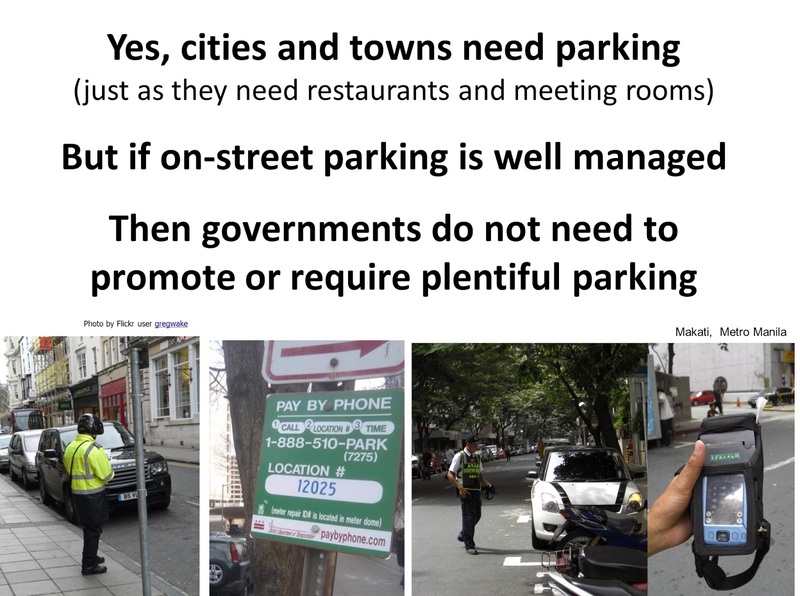 Three weeks ago, at the 6th Asia Pacific Urban Forum in Jakarta, I had eight minutes to try to change some parking mindsets. Here is a summary of what I showed and said. In other words, planning for parking thinks of parking as an ancillary infrastructure service needed with every building, just like the plumbing and washrooms. 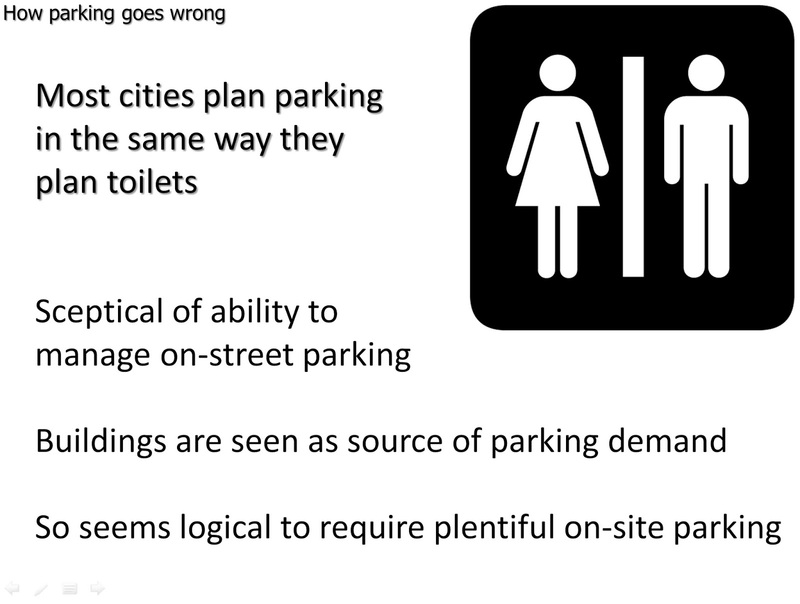 Most local government planning or zoning codes have on-site toilet requirements for most land uses that look just like their minimum parking requirements, except the numbers are different. Parking standards look just like restroom standards. 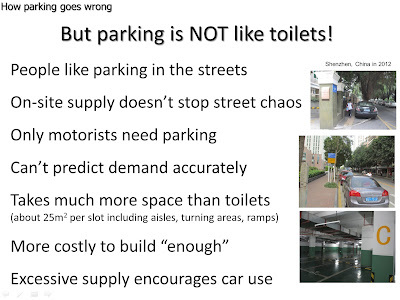 But parking is NOT like toilets! Toilet requirements actually do help people not to have to go outdoors. And we don't need much enforcement to make public urination or defecation a rare event. By contrast, most motorists prefer parking in the street when possible. So off-street parking minimums make little difference unless matched by strong on-street parking management that nudges motorist parking choices around. We are confident we can predict toilet usage rates far into the future. Does anyone seriously think parking usage rates will remain as now in 2040? Or even in 2025? The costs of providing more than enough restrooms are modest. Not so in the case of parking. The impact on the built environment and on human behaviour of having more than enough toilets is negligible. Not so in places where plentiful parking is required on every development site. In any case, the way to encourage developers to build about the right amount of parking is to make sure on-street parking is well managed. 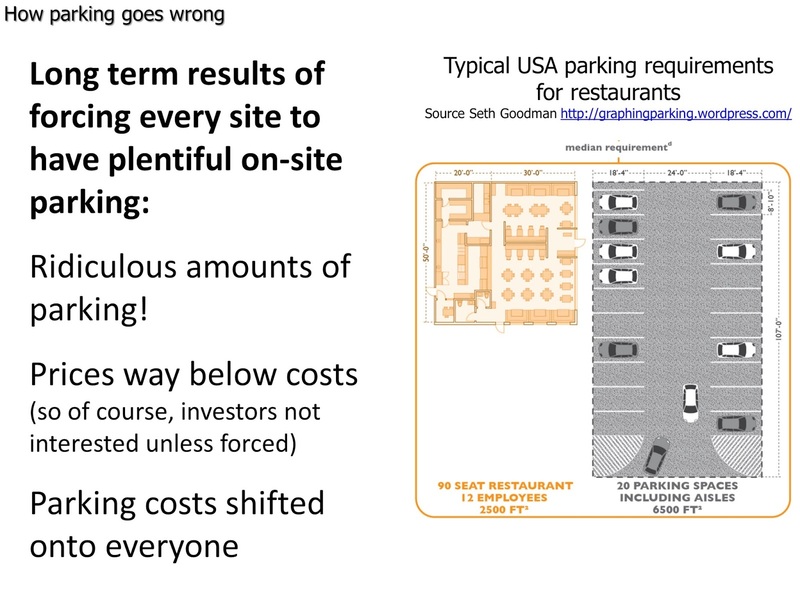 So how should we think about parking planning? On-street parking is not private property. No individual person or company owns it. It is a commons. 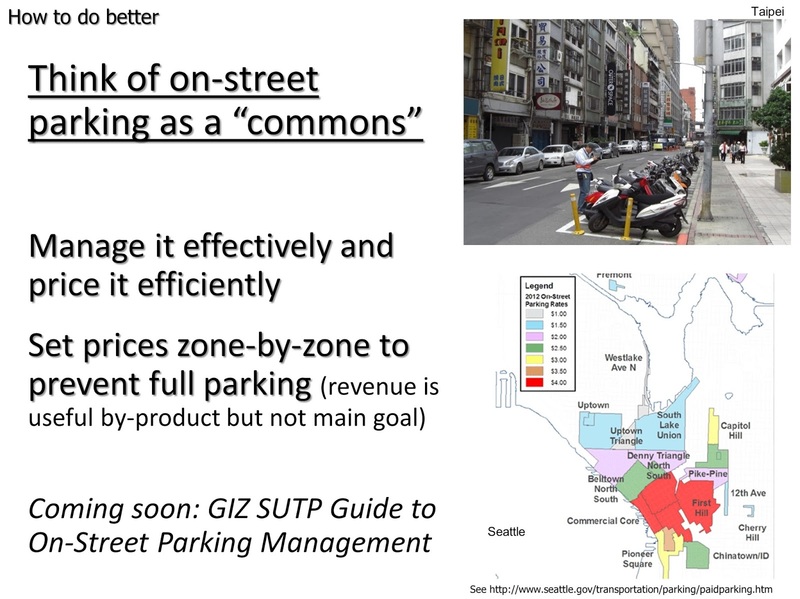 And, just like a river is prone to over-fishing unless fishing is regulated and managed, an on-street parking commons without good management is prone to over-use, which results in parking saturation in busy areas at busy times. 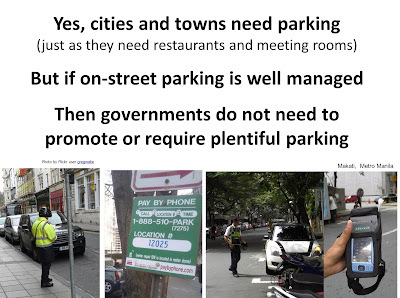 Believers in minimum parking standards tend not to have much faith in on-street parking management. Or they are hostile to it. They don't believe that the parking commons can or should be intensively managed. I say on-street parking can and should be well managed. Off-street parking is different. Unlike on-street parking, most of it is private property. The supply is not fixed. The real estate industry can provide more or less, depending on the returns on their investment and other incentives. 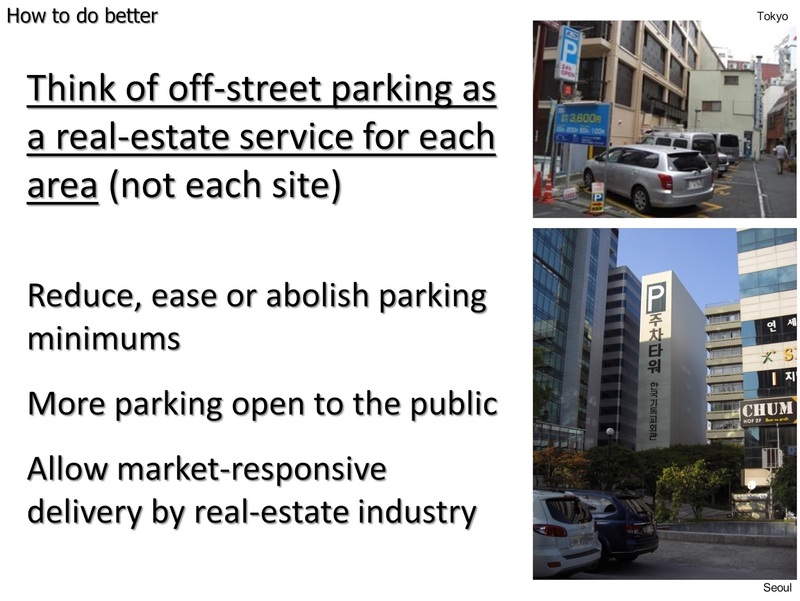 An important focus of good on-street parking management should be to make sure developers, building owners, purchasers and tenants all know that there will be no free-riding on on-street parking. For example, residents of new buildings built after easing of parking minimums, can be made ineligible for on-street parking permits. This has actually already been done by Moreland Council in Melbourne, which was the focus of the news item mentioned at the top of this post. Once we are more confident in on-street parking management, we can all relax and let the real estate industry worry about how much parking to provide with each development. Let developers take the risk and pay the price if they get it wrong and provide too much or too little parking. Have you changed your parking mindset? 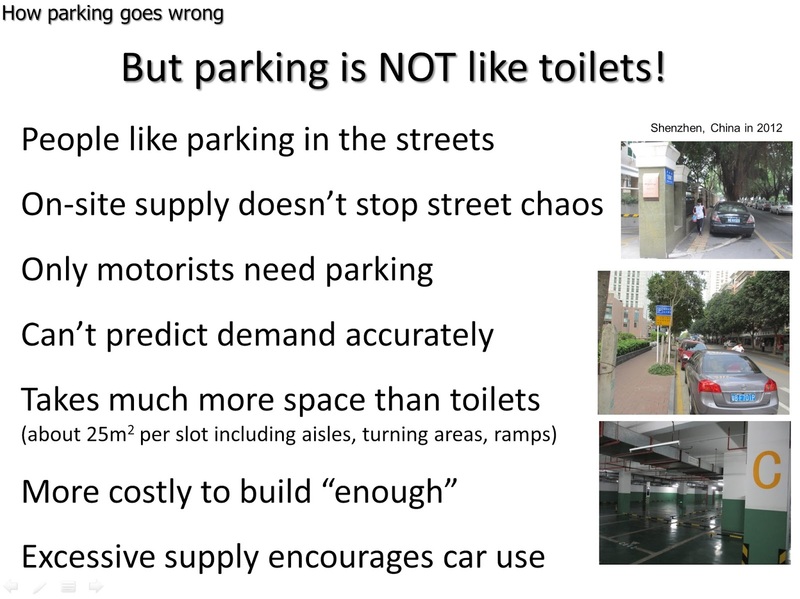 Proposals to deregulate parking supply will not make sense if you think of parking as essential ancillary infrastructure for each development (like toilets). 1. Think of on-street parking as a commons that can and should be managed. 2. 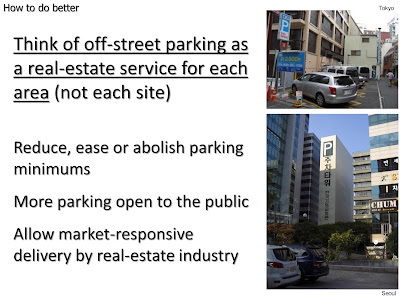 Think of off-street parking as a real-estate based service for each area. Like hot food outlets or meeting rooms or hotel rooms, we can let the market-based real-estate industry handle its supply. 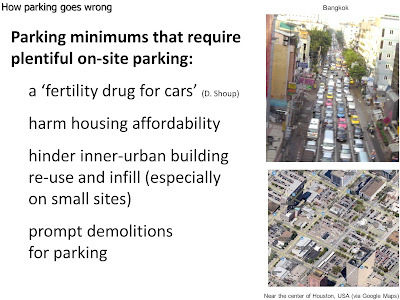 With this parking mindset, proposals for zero-parking buildings right next to urban rail stations make perfect sense. [UPDATE January 2017: The Walkable Parking mindset is another way to explain these ideas. If they resonate for you, then you might want to try the new Local Parking Assessment kit. It allows you to assess any small study area and its potential for embracing the Walkable Parking mindset. 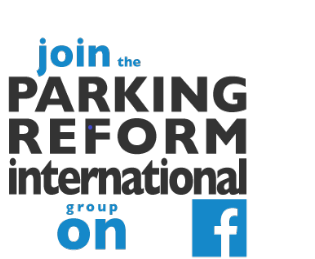 If you are keen on parking success without parking excess, then I think you will find it useful and thought-provoking. Who did you survey to determine that people like parking in the street? I would argue this is absolutely incorrect. Parking lot parking is SO much more convenient & easy, generally! Having to search for an on-street parking space, then dealing with the stress of attempting to park while traffic is passing by (especially if it's parallel parking), and worrying about someone hitting your car are all things that are much easier in a parking lot! I'd even prefer a parking garage to on-street parking, generally. This is probably true for most people in the U.S. I can't speak for people in other countries though.